It’s time for the 30th annual Ijams River Rescue, presented by TVA with support from Lowe’s! Make plans to join in the fun during this year’s landmark event on Saturday, April 6, 2019, from 10 a.m. to 2 p.m. This popular, community-wide event focuses on up to 50 different cleanup sites along the Tennessee River and its tributaries. Each year, between 600-800 volunteers spend several hours removing tons of trash from these areas. Volunteers may come as individuals or in a group, such as families, friends, corporate teams, scout troops or church groups. Bags and gloves are provided, and each location has a site captain to assist volunteers. 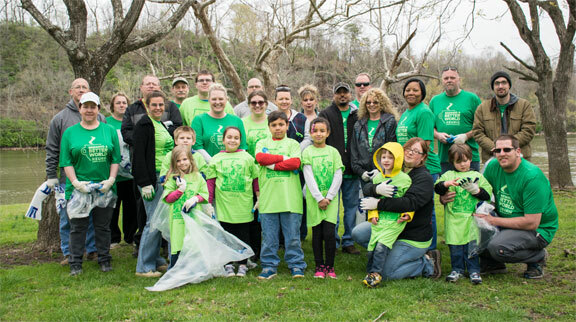 In 2018, the 29th annual Ijams River Rescue was held Saturday, April 7, and 625 volunteers met at 42 public sites along the Tennessee River and tributary streams to make our East Tennessee home more beautiful. Folks came in boats, canoes and trucks. They brought wheelbarrows, rakes and a steely-eyed resolve to “do the right thing.” And despite cold, rainy weather, 39.7 tons of trash were collected from our local waterways. The last time the numbers were this high was during the first three years Ijams tracked the event’s results. The amounts totaled 36 tons in 1995, 48 tons in 1996 and 35 tons in 1997. Most of 2018’s trash—an estimated 30 tons—came from one location: An illegal dumping ground on Love’s Creek. The City of Knoxville hauled away eight truckloads full of debris from that site alone, making it the dirtiest location in the annual cleanup’s history. Even with this record-breaking site, the news is more good than bad: The remaining 41 sites together only yielded 9.7 tons of trash, which is on the low end of what has been collected over the years. Each volunteer will receive a River Rescue t-shirt to thank you for your help with this event! This year’s t-shirt design features a bald eagle, which was chosen because it symbolizes improving water quality as a result of three decades of clean-up efforts! At this time, all public sites are full and registration for Ijams River Rescue is now closed. Unfortunately, we cannot accept additional volunteers above the set capacity for each site. If you are not able to join us this year, we hope that you will check back next year!